You are here: Home » Featured » 3 Business Lessons You Can Learn From…Nuns? 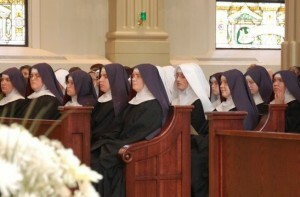 Catholic nuns. When you think of them, you may harken back to grade school, or your great aunt Sister Mary, or maybe even Sally Field flying around your TV screen. But consider taking another look at Catholic nuns. They’re not all rulers, dunce chairs, and old women anymore. They’re marketing geniuses. Despite decades of decline in enrollment, the number of young women entering the convent in recent years is climbing again. One new, yet traditional, Dominican order just saw 22 new members last year alone, bringing their numbers to well over 120 in the last ten years. The average age of those Sisters is only 28 years old. Although you may never have thought of the evangelical counsels of poverty, chastity, and obedience as ways to achieve goals, Catholic Sisters know the secret. That’s because their end goals are holiness and heaven. By vowing themselves to certain principles like the evangelical counsels, they are more likely to reach their destination. In a similar way, you should develop a mission statement for your business. You need to focus on where you are going and how you are going to get there. Once you’ve identified things like sales goals and marketing strategies, identify unique practices to utilize in order to reach those goals. Sisters know that you can’t lose if you love people with everything you’ve got. Nuns run hospitals, schools, and all sorts of ministries throughout the world. Most are selfless women, devoting their entire lives to works of charity. Loving people with integrity and honesty breeds real relationships. Trust is built on these principles. The same can be true for your business. Serve your client with devotion, honesty, and integrity. If they’re wrong, tell them. If they need assistance financially, cut them a break. When you do this, you will win their trust and the rewards of customer loyalty will come back to you. Have you ever been to the airport and seen a Sister? The robes and veils that nuns wear are a visible sign of an invisible reality. That is to say, her outward appearances reveal who she really is, and for what purpose she dedicates her life to. When you see a nun in her habit, you know instantly what she stands for: faith, hope, and love. The same principle stands when marketing a business. Make sure that when somebody looks at your business they know instantly what you are marketing and what your unique selling point is. You don’t want to blend in and be like everybody else in the crowd, because you’re not.